No one likes a detour. But when that detour catches neighbors by surprise, sends heavy traffic onto small side streets, and diverts the flow of customers from area businesses, people are likely to be a bit miffed. And that frustration came out at last Wednesday’s City Council meeting, which heard complaints from three fired-up residents and two upset business owners about the impact of the Riverside/Galveston/Tumalo intersection closure. Their concerns surpassed mere annoyance, and included safety and financial solvency. James McGuire, a State Street resident, worried that an influx of traffic due to poor signage was a danger to his 5-year-old son, who has a tendency to follow stray balls into the street. Neighbor Chantal Strobel said her teenage daughter had a close call with a car that sent her home in tears. “Today my youngest almost got hit by a car crossing Tumalo,” Strobel said. “She was so scared she came home crying and said she wasn’t going to run again.” Strobel added that she had seen large semi-trucks drive down the narrow street and doesn’t feel safe as a pedestrian. On the other side of the closed intersection, Galveston Street business owners said they had seen a sharp decline in business in the two days since the closure of the bridge. “If the numbers from today and yesterday continue, we’ll have to lay off employees. Today…we sent home half of the staff. Twelve people didn’t make any money today,” 10 Barrel Brewing Co. partner Garret Wales said. “Galveston is a ghost town right now; the streets are bare.” Wales and Primal Cuts Meat Market owner Bryan Tremayne also said they received no notice of the planned closure—an oversight city staff confirmed. It seems he wasn’t the only one. After the Source initially published the complaints, a number of commenters contested the notion that Galveston was suffering, citing long waits for a table at the brew pub. On a recent Sunday afternoon, 10 Barrels was packed with customers, the side streets lined with cars. Still, the city responded quickly and decisively, announcing Sept. 6, within 48 hours of the City Council meeting, that it would partially reopen the intersection on Sept. 17, six weeks ahead of schedule. It will allow East-West traffic to flow down Riverside and across the Galveston Bridge. The city has also made adjustments to the detour signage to discourage traffic from using State Street, which was never part of the planned detour. 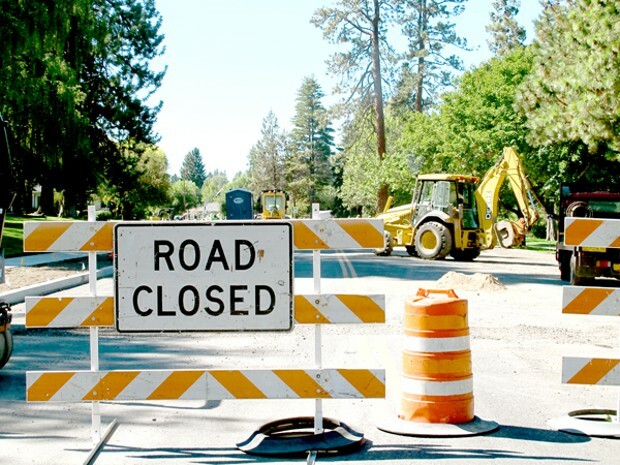 The Tumalo/Riverside portion of the intersection is expected to remain closed through Oct. 31. Five feet may not seem like much, but when it comes to a long-empty lot on the west side of Brooks Street, some believe it could make or break the future of downtown Bend. Depending upon whom you ask, allowing taller buildings on the west side of Brooks Street is either vital to attracting developers or a dangerous step toward the advent of “the Manhattan effect.” It’s a hot topic in a city that is trying to balance growth with preservation and contending with what former Portland Metro executive Mike Burton described as a typical Oregonian resistance to both density and sprawl. After some flip-flopping by the Planning Commission on the issue, City Council considered on Sept. 4 its recommendation to prohibit property owners from applying for a variance on the 35-foot-height restriction. Proposals included keeping the existing open-ended variance policy, returning to a hard cap at 35 feet, or finding a middle ground. Ultimately, the City Council voted to approve for a first reading allowing a variance with a cap of 40 feet and requiring that requests be vetted by the Planning Commission. “You can’t go up, you can’t go down, you can’t go toward the river, you’re stuck,” said Noel Erickson. Jan Gifford was among those concerned that granting variances could lead to a slippery slope.